Links I find useful to read. so your interested in raw thread is pretty useful I don't go on dogster much due to how heavily censored it is, but the dogster raw forum is only one I check also the shiba part.. PERSONAL RAW FEEDING GUIDE a handy spreadsheet that helps get idea on how much to feed I dunno if the link works, but I'll link it anyways.. If you can't download it I can send via email if need be. Newbie thread: Everything you need to know about proteins and cuts! 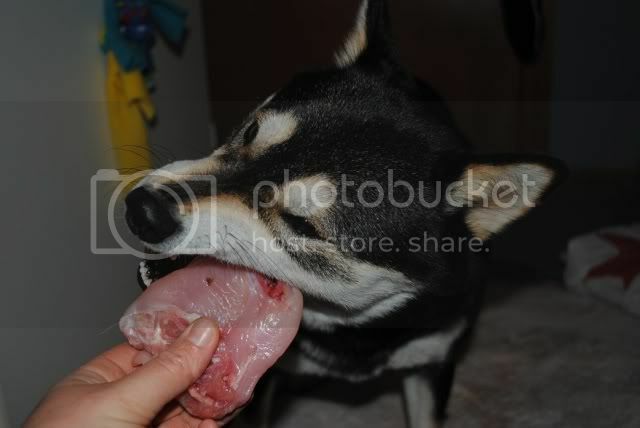 Saya eating a Lamb neck she also had lamb heart with it being as lamb neck is very boney she needed bit more meat.. Various books on raw diet or talks about it. I only read Raw dog food: Make it easy for you and your dog so dunno on the others.. I need buy Dr. Pitcairn's New Complete Guide to Natural Health for Dogs and Cats at least and maybe Lew Olson or Karen Becker.. Raw Dog Food: Make It Easy for You and Your Dog I read this book from library it was OK I don't think I'd spend money for this one..
Any raw fed dogs on the forum? Eatwild's Directory of U.S., Canadian and International Farms & Ranches Lists of farmers who knows maybe one will give scrap meal or organs people don't buy for free or at low price..
My pet carnivore is located in Indianapolis IN they deliver and sometimes ship too I think might be wrong. There's different distributors they're prices seem decent. Here's various video of dog eating raw. Saya eating a whole quail part 1 coarse mom calls me during this.. haha if you like the game Okami the ring tone will sound familiar unless you played the wii version.. off topic me here link to okami end credits sad wii players didn't get this. Another eating quail video better quaility since it was my camera not my 3ds like above video.. Too bad my camera that took video broke.. :( Need buy new one to show how Saya eats chicken quarters and stuff. Add links, blogs, pictures, videos, ask questions and so on. Give tips, advice, what you did wrong when starting and so on.. If you feed barf diet or whatever other kind link info on them too would be nice. I don't feed much veggies or fruit just every now and again, but not as main part of her diet. I can't give much advice what veggies or fruit be best to give. Saya does get carrots, broccoli, and spinach mostly, once or twice in summer I'll give her grilled asparagus or zucchini it's only seasoned with thyme, mint, and lemon also olive oil to prevent the veggie from sticking on the foil in the grill she only gets one or two of the grilled veggies. Saya does like some fruit, but she doesn't get much of it she refuses it if given every day ones she likes is raspberries, strawberries, banana, blueberries, mango, apple, peach, and pear. she sometimes like them though sometimes she isn't interested in them. She only gets them as treats. I don't think she needs them so much especially with variety of things she eats. They are what they eat blog has some good info. Saya's adventure my blog on things I do around house, walks, feeding Saya and so on. Hope I put things in decent order and it's not too messy..
Nice writeup! This will be a good place to direct people to in the future. Currently, I feed a type of raw/home-cooked diet that consists mainly of chicken and pork and oats. It changes based on availability, price, and nutrient content of foods. Instead of writing it all here, you can visit my blog to see how I go about making Conker's food. Meat meals, grain meals, supplements. You can also see how I balance meals with Nutritiondata.com. Here's something to make it a bit more interesting. I have a question for losech and saya...my two pups are 4 months, and they have only really had raw chicken necks, steak twice..a chicken breast...i dont feed them chicken necks any more as the little fruitloops swallow them whole. Because they are still young, do you have any recommendations as to what raw i can feed them? Im not planning on switching to a complete raw diet, but at the moment koyuki is fussy and she prefers raw foods, im scared of them choking. Thankyou! @koyuki You can always hold onto the necks. I have to do it every once in a while for Conker since he'll decide to be a brat and not eat whatever it is unless I hold it. Or, you can give something bigger, like a chicken leg or leg quarter and just let them gnaw off some of it, then feed the rest later. You can give them just about anything they can chew up. Backs, necks, wings, breast, legs, roasts (a whole roast is sometimes fun), cornish hens, any boneless meats like steak and pork... If they have difficulty with something, don't feed it again until they are older and have bigger teeth/stronger jaws. Just keep a record of what they can and can't handle, and only give them what they have no issue chewing up. Conker could get through a pork neck bone (actually chew up and eat the entire thing) at 6 months, so they should be able to eat fairly difficult stuff soon. Dogs rarely actually choke on stuff, and swallowing large chunks after minimal chewing is very normal eating behavior, it just freaks us humans out when we see it. They can choke though, I'm not trying to downplay it as choking is a real risk for any food (I know someone who's dog died from choking on kibble) but in order to avoid it, you should teach them to chew longer by feeding bigger pieces (larger than their head, for example) or holding onto it. You can cut stuff up into tiny bits but with bones, that can be difficult. And as a rule, always supervise them when they are eating food, especially with bones in it. @koyuki Sure, but take it really slow. Only give a little sliver at first since organs are very rich and too much could cause a blow-out. If they don't have a problem with it, slowly increase the amount you give until they can handle a "normal" piece. 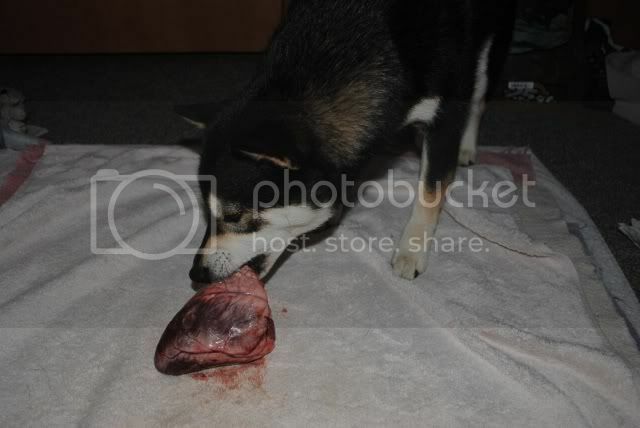 For Conker, that is usually about .3 ounces of beef liver, or 1 ounce of heart. He can handle up to 2 ounces of liver at once no problem now, but it took a while to get him to that point. Saya loves chicken quarters I let her pig out on them and she will eat whole thing sometimes she'll leave a bit of the quarter for next day.. If she ate who quarter I'd give her small meal for the next day..
Saya was switched at 8months to full raw, but at 7months she got raw lamb ribs once week as a meal I'd give her a egg and some caned fish with it too. She was already used to eggs when I gave it to her once a week at 6months and she got caned fish since I got her at 8weeks old. 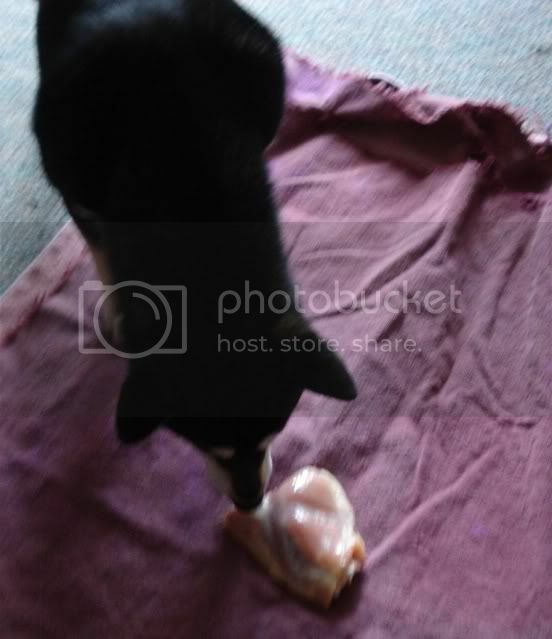 For chicken she eats bone in thigh, drumsticks, breasts, cornish game hens or whole chickens. Pork she gets pork ribs, pork shoulder roasts and when she was new to pork she got pig's feet they were split never can find whole trotters.. Pig feet are very boney, it's mostly bone with tiny bit of meat, tendons, and skin. I need buy some for Saya I still got lot bone in meals to last her..
Pork shoulder roasts is a meat meal, but once she gets close to the bone it becomes a bone in meal RMb. RMB= raw meaty bone. Saya's 9lb pork shoulder I got for 99cents lb . What it looks like now left is pic last time I fed her the roast right is after she ate it. it weighs like 3 or 4 lb or so now. Here's top part of the roast it's a joint part Far left still has meat on it, middle she ate some of the bone, far right she ate bit more of it. Coarse with a thing this huge if I only gave her that she'd have loose poop from having no bone to firm the poop up..
With organs might want to wait to see how they do with the chicken no need to rush into organs and variety of protein till the dogs do good digestive wise. If you want you can give a probiotic to help? Ark naturals gentle digest works good I read I still need buy one just in case I need it. If you want When they're OK you can give tiny piece, but not too much 2.24oz is Saya's full weeks worth of liver or other secreting organ according to her spread sheet. She sometimes gets tiny bit more, but not by much. She can tolerate getting 2.24oz liver or other secreting organ at once or both the liver and other secreting organ as a meal. Organs of any kind is rich so some might not take well to that much all at once and some takes long time to get used to it. If they eat kibble it's not going to hurt them to not get any organs or even tiny bit so giving tiny bit till they're used to that amount is fine. 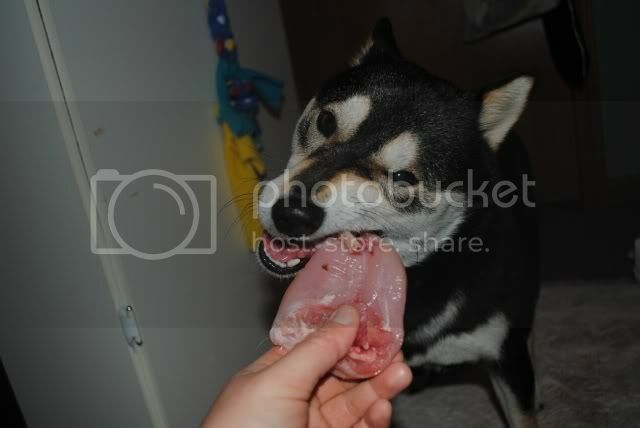 Lamb ribs are pretty edible for Saya it was her first time eating raw bone in type food. She would only tear the meat off the lamb rib and crunch and eat little bit of the bone and leave it. Now she is older she'd eat the whole thing with no issue. Be sure any meat you get isn't enhanced by any sodium, broth, or marinade the extra sodium isn't good. it'll say on front or back on nutrition area sodium above 90% or 100% is enhanced. I've gotten a big turkey which was enhanced for free, but I just cooked the meat up and used as training treats or to make turkey flavored home made treats. Saya eating a goose back. :D I only let her eat half of it she also got something else I forgot. Grass fed lamb heart she ate it all and it weighed 11.11oz yummy! Heart being a type of organ it's rich it's not counted as other secreting organ it's a muscle meat type organ. I still think giving some heart is important too.. Feeding this amount might cause loose or watery poop for some dogs who can't handle it. Some can only eat a little bit of it so go slow with this too like liver or other secreting organ or introducing new protein introducing slowly is best way to go. Saya has stomach of steel so she handles things like this well coarse she has had loose or watery poop few times throughout her three years of eating raw, but it was usually me giving her too much variety when she wasn't ready or too much of something. 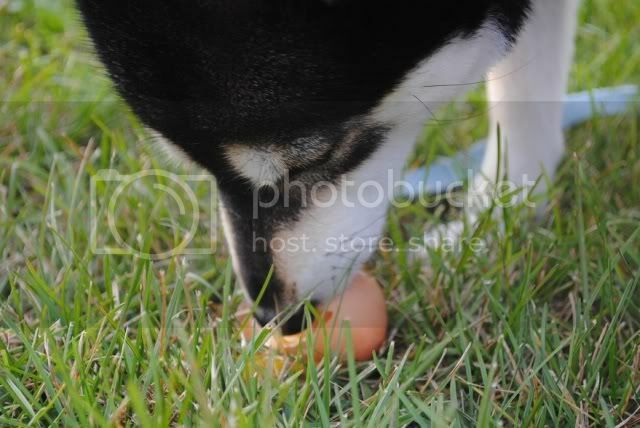 Yummy raw egg in the yard. I normally crack the egg for her and mix it in her dog bowl much easier that way, but I tried it this way to see how she'd do. She used her paw to crack it open I was hoping she'd bite it to open the egg, but ah well. Her paw had egg white on her. lol I just wiped her paw with a mix of water and vinegar. Great idea to put all these resources in one thread! Thanks--it will be a great reference! Edit: Is premade raw gorey at all?? I'm used to cooking chicken, beef, and venison so I'm used to seeing them raw but anything else is a little gross for me :P Also, @Saya it looks like you are the expert on raw on the forum so I'll ask you a couple questions. The eggs you feed, are they special eggs or just eggs from a store? And what type of canned fish do you feed? I'm guessing not tuna because of the mercury content, but who knows! I'm almost clueless when it comes to this! Pre made raw isn't gorey hehe it's like ground meat kinds in frozen nuggets. I've fed pre made raw to Saya she seems like them I got her bison kind and also the lamb kind had two coupons to use. I've fed it thawed and frozen I prefer frozen Saya got ahead of herself and swallowed a piece which she had to regurgitate it and re chew it. The second nugget she ate thawed after regurgitating the first she chewed it properly. I fed it frozen after that seems to help slow her down with it. Eggs I give are from grocery or free ranged from local farmers some are from workers from mom's work they got chickens at home. I prefer the free ranged farm ones compared to grocery kind they even taste better when I make my own eggs. Saya seems do fine with either grocery or free ranged local farm eggs. Caned fish I give caned sardines kind in water only not the oil, mustard, or cajun sauce, water kind only, I also give caned mackerel, caned salmon and also caned salmon type that has skin and bones on it still. Caned mackerel and caned salmon with bones are safe the bones are very soft from canning process I can crush them with my findings and are soft. I don't give tuna due to mercury content I given it to her once, but it was only tiny bit, but I prefer to give her caned sardines, salmon, or mackerel then tuna. Yeah raw can be gorey especially if I give big semi boneless leg of lamb or heart.. lol or whole prey quail.. I feed the quail outside so it isn't too messy feathers she doesn't eat stay in the grass and degrade or whatever. I do keep some quail feathers I'm planning to use it for a toy to give it quail smell or something.. I'm no big raw guru been feeding it for three years, but I feel it's best diet for Saya with her health needs. Raw isn't for everyone so not everyone has to feed it if they don't want to. 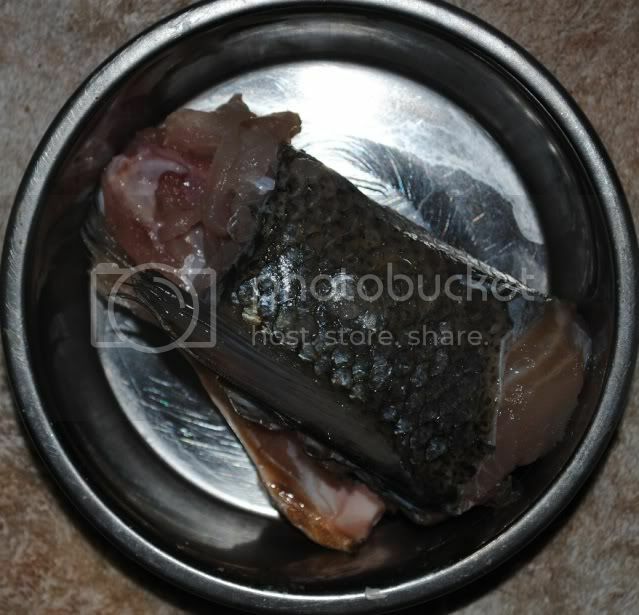 When Saya was on kibble she got caned fish, cooked meat, and cooked egg once week put on top of her kibble as a special treat. I know some people who are vegetarians and they feed raw. I think I'll probably stick to kibble, and maybe give something raw occasionally as a treat. For now at least. Eggs you just give to saya untracked and she doesn't eat the shell? If you cook and prepare meat for yourself, I don't think it is any more gorey than that. 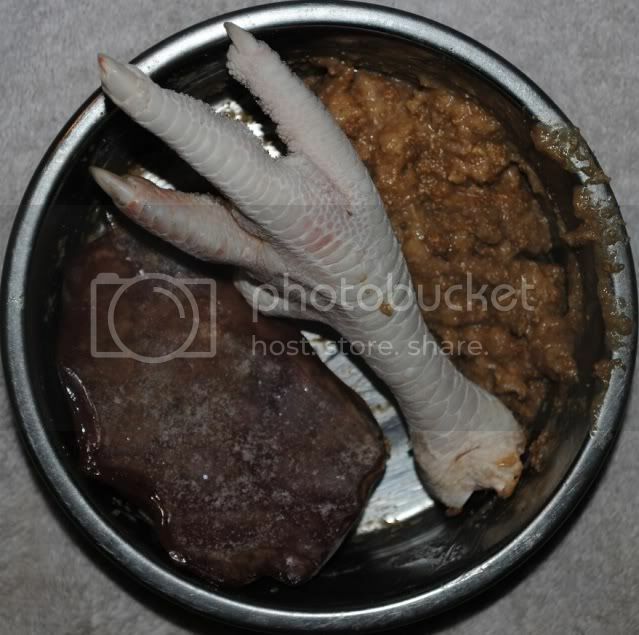 I just feed my dogs raw chicken--backs, necks, thighs or legs. It's pretty easy--just toss it in their dishes. I don't find it gorey at all. You can just give them eggs from the grocery store. Shell and all. Mine only eat parts of the shell, though. And for canned fish I feed sardines, mackeral, cheap salmon. 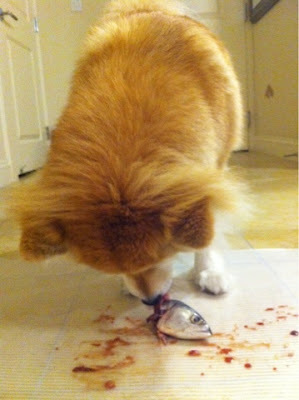 Right now my male Shiba is on a diet, so he gets fish (white fish, whatever is cheapest--I buy frozen filets) and veggies. He likes peas and carrots but does not like green beans. I don't know quite what chicken frames are? Neck/backs? They can eat those. They can eat any chicken bones as long as they are not cooked. Cooked ones will splinter--raw ones will not. And @Kitsu....feeding raw is much cheaper for me than buying a good quality grain free kibble would be to feed three dogs. I'll only have one dog. The breeder I talked to feeds Iams Puppy, Iams is a pretty bad brand in terms of quality I heard. Could this just be because 18+ dogs to take care of could be really priceY? I mostly give Saya eggs in her dog bowl no shell though she doesn't like eating the shell so I don't give it to her I just wanted to see how she'd work out the whole shell on egg. Frames should be fine to give it has meat covering it right? When Saya was new to raw she would tear the meat off the chicken drumstick or thigh till there was bare bone then she crunched the bone and ate it, but after week she did less and less of that and ate the bone with meat on it still. Being the frame might not have as much meat in it might want to give bit of meat depends on how much it has. Been a year since I seen chicken frames so I dunno. Saya has eaten chicken breast bone in fine. chicken bones are pretty soft compared to pork or lamb. Saya can handle pork and lamb ribs fine. Yesterday she got beef steak like 4 or 5oz of it. Today she getting a fast she gets treats with training, but no food then tomorrow big chicken meal. I'm not sure Saya's breeder fed her chicken soup for puppy lover soul I forgot it's price..
Saya eating a meaty piece of ox tail I can never find ones that aren't cut up.. I might see if the butcher can hold some whole ones aside for me or maybe keep skin on too for more work.. I don't give bone in beef often due to how hard beef bones are and I'm just not sure on them.. 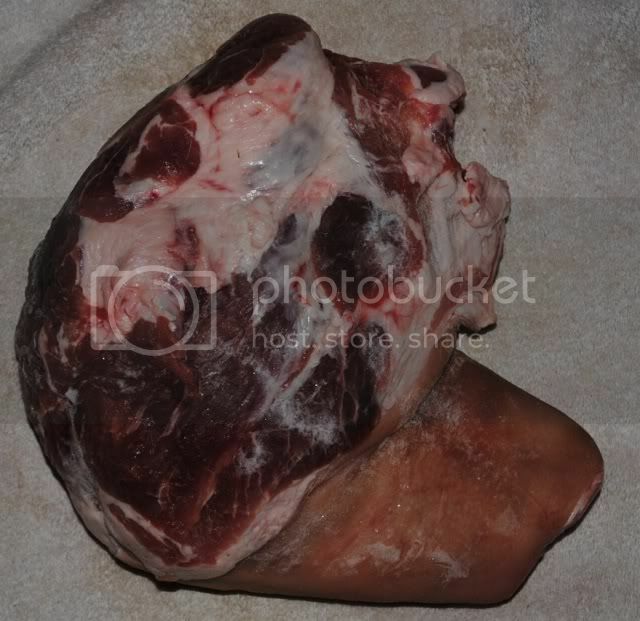 Beef ox tails seem not pose Saya much issue I always get that size of oxtails because it has a lot of meat to make it a good meal.. Saya sometimes can grind all the bone down and sometimes she leaves a little which I throw away. I've also given beef ribs which she does good with and can grind little bit of bone after tearing all the meat, but I didn't give her beef ribs till her third year on raw. 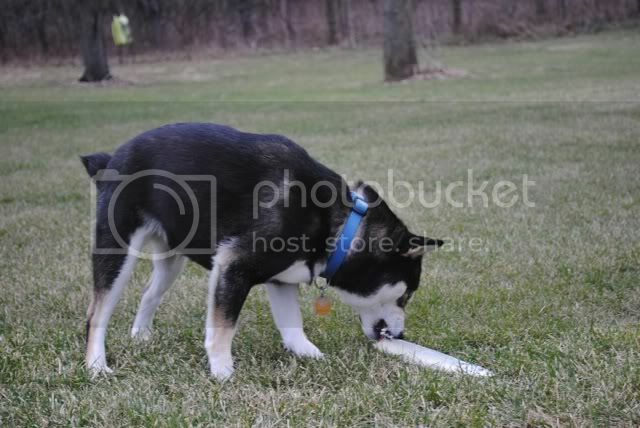 Feeding raw is know your dog kind of thing if your dog will try to crunch the rib in half then it's a danger to them and best not give in till he/she knows not to do that or maybe that type bone isn't for the dog. I'm lucky Saya tears the meat off and grinds on the bone, but not too hard or anything.. I feed frames then! wasn't sure what they are. and it's actually good for them having the kidneys or liver or whatever attached--that gives them some organ meat that is good for them (one reason to feed backs is that it has organ meat attached). If you follow a classic BARF diet a la Billinghurst, than you go with a fairly high bone content and lower meat content. I've done that for years, but we're just finally switching to adding a bit more meat now. (In the classic BARF diet, necks and backs (frames!) are a pretty big part of the diet). Someone asked in a (now closed) thread about the quality of meat, and where you get it. (They were asking about non-GMO meat, but as far as I know, genetic modified stuff is only in plants). Anyway, I am concerned about the quality of the meat, which is why I bought my chicken from a local butcher that did not use a lot of extra stuff in the chicken. However, now we're using a variety of bags of leg quarters and the necks/backs from this butcher. The bottom line is I can not afford to feed myself all organic or free range meat. I rarely buy meat from whole foods for example: I can't afford it. So while in an ideal world both my dogs and I would eat that kind of meat, we don't have the money for that. Since all the meat I'm buying is for human consumption, I feel ok about it. I don't believe I would be getting better meat if I were buying kibble, and while I probably could find kibble that was all organic, free range chicken or whatever, I couldn't afford that either. So no, I am not worried about the quality of the meat--or rather I don't worry anymore than I do over what I buy for myself, meaning sometimes I DO worry about factory farming, etc., but right now, there is little I can afford to do to avoid that. i was looking at hare-today website and I noticed they sell the ground meat/organ/bone mix...which is a lot cheaper than what I am paying now for the premade raw (i.e. primal..nature's variety) . so if i feed that, do i need to supplement veggies? Veggies IMO isn't a requirement for a dog's diet. =) If I do give fruits and veggies it's as a snack, not part of their meal. I do know that some people substitute some veggies (such as green beans) when trying to get their dog to lose some weight. I would if I could but I simply cannot afford, at the moment, to feed sustainably raised meat. I would love to, and plan on adding some into the diet soon, as it is much better across the board in pretty much everything. No veggies here, but I do feed oats. Veggies are a snack to my dogs, normally one that is destroyed and not eaten, so more of a toy really. You only need to feed veggies (or in my case, oats) if you cannot get something that a meat-based item would cover, nutrition wise. I can't get any organ except liver, and a couple other things, so I replace them with oats, until I can. It may be worthwhile for people interested in feeding non factory farm raw to see if there are any local pasture raised farms. A lot of the pastured, organic meat farmers you see in green markets, if you ask they often have backs, necks, feet, and some organs available for significantly less money than the rest of their meat. It's not usually listed on their boards but it is often available (marrow bones too). The price I've found (in NYC, one of the most expensive areas in the country) ranges from $1.00-$1.50 per lb which is significantly less than high end kibble. At any rate, if you're interested it is always worthwhile to investigate the local farms and speak with the farmers directly if it is possible. @shibamistress, im so glad you feed frames too i started panicking for a bit thinking they shouldnt be eating it! Lol poor guys were so peeved when i took it away from them, but the frames are pretty big too so they are going to finish it after our run today. Im in the same boat as far as organic meat is concerned... i would love to be able to feed the whole family the organic option as well as my dogs but its just not an option for us. I take comfort in knowing that they are eating the best quality kibble available here, and that they get raw too (which most other dogs i know dont get either of those options) and they are very healthy pups so non organic cant be too bad! Shibahiro it's up to you, but Saya had their grinds and had no issues with it I got her the mutton, the duck and the goat grind. The goat had tripe in it even yummy! Tripe or beef gullet is closest I've given that had bits of grass in it she ate with no issue, but I only got one lb of tripe due to it's smell I wasn't sure if it'd be too much or something it's not too bad stinky, but anything for my pup.. I portioned it semi thawed so it was still partially frozen and easy to take a oz and ball up to freeze individually. Search blue ridge beef to find a distributor they sell tripe for good price.. 30lb box for $34 or so? I forgot at least the distributor near me in Indy. I've given Saya really cooked soft carrots, spinach, broccoli and grounded up and she ate it only when it was mixed with caned fish, egg or ground beef she wouldn't eat it on her own. I know barf diet calls for veggies, but I don't think it's needed I follow prey model raw, but she does get fruit as treat she likes them sometimes and sometimes she acts like it's poison..
Saya does like grilled asparagus and zucchini, but it has no season except thyme, mint, lemon and olive oil. I don't grill veggies often only like once or three times year it depends. I've gotten 10lb of free raw from my craigs list ad this lady had some freezer burned meat so I got bit of beef, deer roast, deer loin, deer stew meat, and pork shoulder roast I also got a big turkey for free it was enhanced so I cooked it up and used for training or making dog treats. If you feel veggies and fruits are needed you can cook and grind them up and add them to the mix. It's up to you there's many types raw diet which work for different dogs. Since Saya refuses veggies so much I don't force it on her or disguise it to get her to eat it every day. Bella likes carrots, but when she eats them her poop has orange pieces. Like for Saya she mainly gets red meat pork, beef, and sometimes chicken and regularly each week fish. I need get her some more chicken she still has a whole roaster to work on and a bit of turkey wing..
Asian markets and Mexican markets is good place to find organs, fish and stuff. Lately, there are a lot of news in Taiwan arguing over whether to ban US beef due to the usage of ractopamine, a meat-leanness enhancer, but seems like people here doesn't really care about that issue as much. I eat beef almost everyday and I'm feeding Maya raw beef as well. Sometimes I do wonder if it'll be worse for her as she's eating them raw, while we have it cooked. I've been thinking about going organic for the entire family, but cost is still a big concern for us. Everything is a bit pricier here in the Bay Area, but most of the time I get something within $2/lb. Maya, who weights around 20 lbs, will need about 12 to 15 lbs of food per month. If we go organic, the price might go double or maybe even triple, and it'll also be hard to find the same amount of variety we get from Chinese supermarkets. Yeah feed lot beef is a concern for me since they're fed a unappropriated diet.. Cows need grass and herbs or whatever and graze.. I'm lucky Indiana where I am has local farmers I'm hoping the beef scrap from the meat processor is mainly grass fed I know they process local farmers who let their cattle graze on grass..
Saya's organs are all grass fed or free ranged except her chicken gizzards..
Meat I've only purchased free ranged pork ribs rack once, stew beef once, and lamb and ewe a few times ground.. Organs are cheaper and farmer sometimes gives me a deal since not many buy liver, kidneys, hearts and tongues..
Lol I love your cows need grass and herbs comment. All cattle need forage and even feed lots cattle are fed grasses it's just in the form of hay or silage. Lol. Feed lots can use things like growth hormones which I would be more worried about. I must say thank you for starting this thread I have always been told raw is bad and all the bad things about it. But I'm glad to read the other side of the story to see the goods. I look forward to sitting down and reading this more in depth. Yeah I know.. feed lot cows and feed lot any animal is just sick I drove past closed in pig farms or chicken farms and omg the stink! When I went to a local farm who free ranges their turkey, chicken, and pigs barely any smell compared to the closed in. They even move the pigs to different pens so they have different forage spots each month or something like that.? Hormones and anything like that is yucky too so sad everyone used to eat grass fed and free range then once industry farming came it changed. Coarse grass fed and free ranged is expensive.. I can only do the organs and sometimes meat when they have it on sale. I do taste a difference in eggs compared to grocery even. Raw has bad rap with vets, but most likely it's due to the owner not researching it and giving the dog wrong stuff and not balancing it right. Raw is pretty simple once get used to it, but does take some getting used to. If I couldn't do raw I'd probably be doing home cooking I'm nuts like that I guess I just feel kibble isn't enough it has all nutrients sure, but it's not fresh and not much variety. Here's a pic of Yesterday's meal a chicken roaster. She ate 14.43oz of it yummy there is about 10oz left so enough left for one or two days depends on how much she wants..
Once this gone she has a bit of turkey piece left then I'll need get her some chicken or turkey for meals. Thanks @shibamistress for posting my comment from the other thread! I got busy at work and then went to pick up my puppy from SC so I didn't have time to move it! I'm going to have to scour through this thread as I'm seriously considering switching her to raw. Her coat has a lot of dandruff in it that I think would really benefit from raw. Thanks for making this thread Saya. The links were really helpful. I'm thinking of switching my little shih tzu mix to raw because she is one picky eater. We already went through 6 different types of kibble and she gets bored of them fast, even end up skipping meals. I was wondering if switching to raw will help me fix this problem. I already checked with the vet and they said she has no health problems....so im trying whatever i can to get her to eats meals. She loves canned food but will picks her kibbles out, to avoid it. Unfortunately i cant just feed her canned food since its so pricey. Any advice would help, thanks in advance! Sorry your shih tzu being picky.. :\ I've been lucky my parent's past dogs were all pigs ate anything they got..
Bella my parent's boxer she eats kibble, but does get raw treats once in while when there's room in freeze. she'll get it much more once I get my own small freeze..
Saya was only picky with kidneys, heart, and tongue she also didn't like catfish which cat fish isn't important I just gave her tiny bit as treat. Saya's third raw meal a chicken thigh yummy. With kidney I just offered it in tiny pieces frozen before her main meal most times she refused I fed her main meal and took the tiny piece back in the baggie in the freeze. and offered it next meal. When she got ground beef I'd put tiny bit of kidney in it to get her to try some. I'd sometimes offered her the kidney before meal and if she didn't eat it I'd put it away and she didn't get meal and then I'd offer her the kidney a bit later and if she refused again I fed her meal.. Now she likes kidneys frozen or thawed. She hated tongue and heart which I think being such new item and odd texture. Saya sniffed it and licked it, but didn't eat it. First time I offered her beef tongue I gave her whole thing see how she did so I must overwhelmed her with such big item! Raw is coarse a big undertaking for a dog especially a picky one, but who knows maybe the dog will like it. Maybe try pre ground raw at first it's sorta like caned dog food in texture maybe not exactly, but I dunno. I had hold it to get her to eat it she ate meat first then crunched the bone up. Then you could incorporate RMB like chicken bone in items see how the dog does with it. 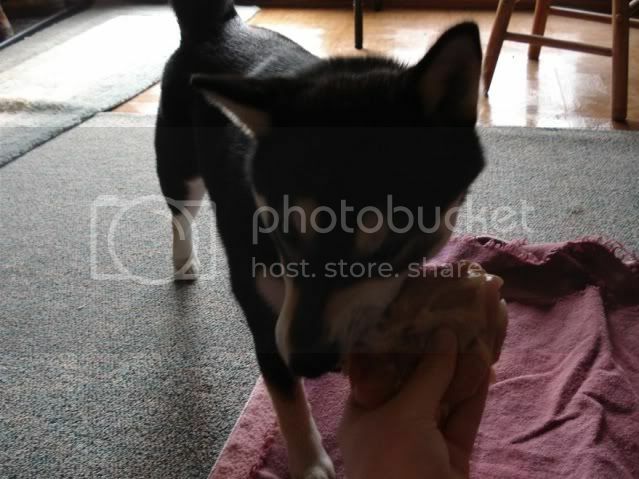 Dogster has some chihuahua on raw which eats bone in items just find also poms and a few other small raw fed dogs. Quail, rabbit, Cornish game hens are good sizes for small dog size wise. There's two different Cornish game hens I've seen there's Tyson ones which are bit bigger, but there are kinds that are smaller which would be more up to a small dog. 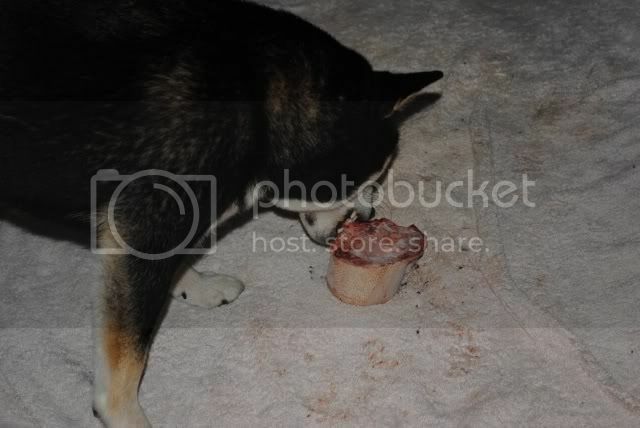 Saya has had cornish hens she liked them hehe lasted her for a week coarse she also gotten ground bison, gizzards, and bit of liver through out the week.. 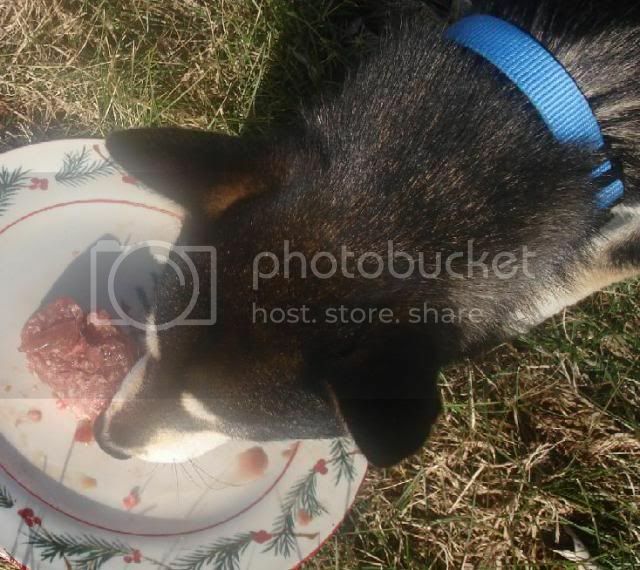 Some dogs love liver and kidneys some don't coarse some organs are needed I know some who has mix the organs in ground beef to get them to eat it or cook it..
Saya eating a ground ewe got it from local farmer. With raw might like it might take time took Saya full week maybe week and half to be able to eat meal without me holding it for her before that I had to hold it so she would eat it she would eat the skin first then meat then bone..
Don't want to give too much of bone or dog might have powdery poop which doesn't hurt Saya has eaten very boney items like pig's foot and had small round white poops which I learned to be sure she had bit of boneless meat or organ with it to help balance it. Also with bone in item if it doesn't work out don't worry you can put back in fridge an try again if no avail you can lightly sear it not enough to cook the bone just cook the meat to give it a bit of a smell. don't give too much fuss over not eating might make the dog more nervous just offer it with Saya I had hold it for her to help her eat it, but she learned to eat it she still doesn't use her paws to eat her meal like Bella which is fine.. Sorry for long write up I hope it works out. lol. I love your detailed posts. It really helps. I'll research it a bit more and see how it'll work out. But in the meantime i'll try some raw treats. Thanks Saya! I startred to transition Kenshin yesterday. I got a really good deal on chicken wings, and kenshin is in heaven. My only issue is if this is a good cut to start with? Im doing it slowly so Ken still has acess to kibbel. Did part of a wing yesterday, and he finished it with a full wing for breakfast. I didn't see any weird poop, but im not sure if its too soon to know if its too much bone content. Hearing that first crunch and seeing his joy, made me wish I started sooner. I've been considering switching to a raw diet for a while, but I still have a lot of concerns. I want to make sure I'm giving an adequate amount of food. We had our local dog shows a few weeks ago, and I spoke with a HPP (healthy pet products, http://www.healthypetdiet.com/) dealer. I went so far to buy some frozen duck backs and some pre-made beef sticks (2oz). I'm still very leery about taking the plunge. I've read to aim for about 2% body weight per day for my 1 year old (about 30 lbs) and 6% for my 5mos old (about 12 lbs). If I'm doing the math right, am I supposed to feed about 3/4 lb of food per day for each? I know that premade is more expensive than what you can find at your butcher/grocery store, but that still seems kind of expensive to me. Am I missing something? For pup I've read to feed 10% of current body weight or 2% expected adult weight I never started a pup on raw that's what I read can ask on dogster raw forums about that.. Coarse it depends on the dog some need bit more some less. Saya was fully switched to raw at 8months old she ate bit more like thigh in am and thigh pm drumstick am and drumstick pm or breast as am and pm meal. It depends where you live and stuff like that butchers, meat processors, farmers, or ethnic markets is good place to look for deals. I always check ads for good deals and buy a pack or two of the item.. Lately haven't been buying much I'm trying make room so I can order stuff from hare today.. Need get me my own freezer eventually.. I haven't had buy anything really last thing I bought was white fish was going to buy some pork heart from meijer, but I opted not too since farmer market opens for Easter and they usually sells stuff there. I try to stick to 88cents lb to 1.99$ lb on pork, 55cents lb to 99cents on chicken sometimes more. Beef I haven't been getting much deals on beef roasts I usually buy ground for $1.99lb and did spend a bit more and got a thing of beef cheek meat from walmart. I get lamb ground, ribs every once in while I never get them on any deals much. I gotten a lamb shank for good deal and semi boneless leg of lamb or decent deal still more then I usually pay for, but still. Pork chops and pork shoulders are pork that usually goes on sale for decent price. I think do it yourself raw is cheaper then pre made plus I know where the stuff comes from and what part of the animal she gets. You could do once week treat like I did with Saya see how it goes..
Saya at 6months got a raw egg once week and then at 7months she got a thing lamb ribs once week along with a raw egg as a meal instead of kibble, then at 8months I bought two packs of thighs and a pack of drumstick and started her on that then she slowly got into pork once she was used to chicken. I started three puppies on raw. The Shibas (one at 7 weeks, one at 4 months) both took to it immediately. I gave them chicken wings cut up when they very small (those little "drummettes" as they sometimes call them at the grocery store, which are just cut up wings). Both of them were in heaven and had no problems eating them. I went the same route with my Akita, but he had a harder time with the transition, and despite being a bigger puppy, he couldn't seem to handle the bones when he was very young. We tried with the wings, but he just couldn't get the hang of them, so we went back to a mix of grain free kibble, rice and ground turkey. he also had coccidia, though, so we were feeding him bland as we got through that. He started eating chicken wings at about the same time were were able to wean him from three to two meals a day, so that was maybe at 4 or 5 months? I'm not terribly helpful about how much to feed. Back in the day when I started, there weren't a lot of resources for raw feeders and everyone was very vague. Feed enough so they are not fat or thin, people said. So that's what I had to do, and now I'm just used to doing it and never measure or weigh out the meat. Puppies will stop eating when they're full, so that's pretty easy. As I recall, little pups got a half a wing, and with little ones, I do supplement with grain free kibble (though my Shibas quickly rejected the kibble for the meat!). Premade raw is outrageously expensive. I can't afford it. We just get meat from the grocery store, and we buy when it is cheap and we buy a lot at a time. I once got like 10oz of free meat from a craigslist ad I put out I gotten deer loin, deer roast, deer steak, pork shoulder roast, beef steak, and turkey. Person who gave me the freezer burned meat had two cute labs! I was like why don't you cook this meat and put it on their kibble! I can understand maybe they're allergic to certain protein, but can't be allergic to deer, pork, and beef?! Maybe so, but still I think they'd enjoy bit yummy stuff..
Ah well their loss. Deer actually didn't look bad freezer burned wise. Turkey was enhanced so I took it anyways and cooked the meat and organs chopped it up put them in baggies for kibble topper for Bella, training treats or making home made dog biscuits. If your worried with digestive issues give a probiotic might help aid in the transition. get probiotic not yogurt the pill or whatever ark naturals has one called gentle digest. Yogurt has it, but some dogs don't do good on it and I read it doesn't have enough to help..
Saya does get plain Greek yogurt as yummy treat or snack she loves it. I don't give it often she had it probably twice or four times between last and this year. How old can freezer meat get and stay safe for a dog? Im probably going to stock up on meat soon, my mom gave me the deep freezer to use and its big. Im in ny so haretoday seems like a good option, though Im probably going to hit he farmer's market and see what they have first. Glad to hear chicken wings are a good option to start with. So far no problems. Though he did have oatmeal in the morning as well. Freezer burned meat has some nutrient loss I believe, but meats meat! I gave it try and otherwise the lady would have tossed the meat in the trash at least I'm guessing.. I mean I don't feed a diet of sole freezer burned meat, but if I put a ad up get some meat I'll feed it long as it isn't enhanced or seasoned if enhanced I can cook for tiny training treats doesn't bother Saya since she gets it in small amounts. Someone once fed a 20 year old frozen chicken roaster once. Longest I've read on freezer burned meat.. Saya's was from 2007 and 2009 I got the meat in 2010 coarse it has all been eaten. Really I think the deer wasn't freezer burned at all when I opened the packages they looked fine not like freezer burned meat I've seen before. I don't think freezer burned meat can hurt issue is mainly if the meat gotten thawed out and sat in freezer due to long power outage then the person refroze it then gave it to someone asking for raw freezer burned meat.. I asked lady what types meats and if it was thawed any and she said nope. Only time Saya had deer was that freebie well I did buy bit of deer heart and liver from a deer farmer. Hare-today is pretty good stuff good you live close by it. I've gotten their beef lung, beef gullet, beef organ mix, beef pancreas, goat meat/bone/organ grind, duck meat/bone/organ grind, and mutton meat/bone/organ grind plus 1lb of green tripe, and bag of whole quail. Yummy stuff lasted Saya for while. 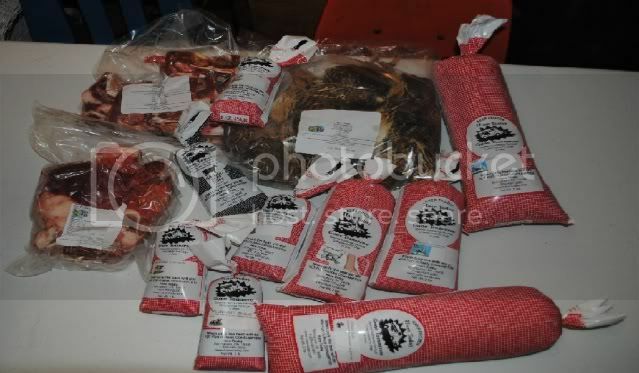 I'm making room to do another order soon.. Today farmer market opens for Easter weekend I plan to go and get some tongue, heart and kidney if they have it sometimes they have it sometimes they don't.. I just struck gold, leg quaters are going 69 cents a pound. If anyone is in brooklyn, ill tell you where if you pm me. I have to tell you all about something funny that happened with Toby last night. I gave him his tilapia filet and some peas. He gobbled everything down quickly as usual (I thought). Then later, I saw he was playing with a toy, and he wanted to take it outside, but toys usually stay inside, so I grabbed it. Yep, it was the tilapia. Then I felt bad that all he ate were his peas! My husband says he always cuts up the meat for all the dogs (I do not), and that Toby couldn't eat the filet whole, which of course isn't true--he's quite cabable of eating it. I cut it up and he ate two tiny pieces and turned his nose up at the rest. Awesome thread. I've never given my dog a full on raw diet but shes had plenty of chicken drum sticks, chicken thighs, and pork ribs. 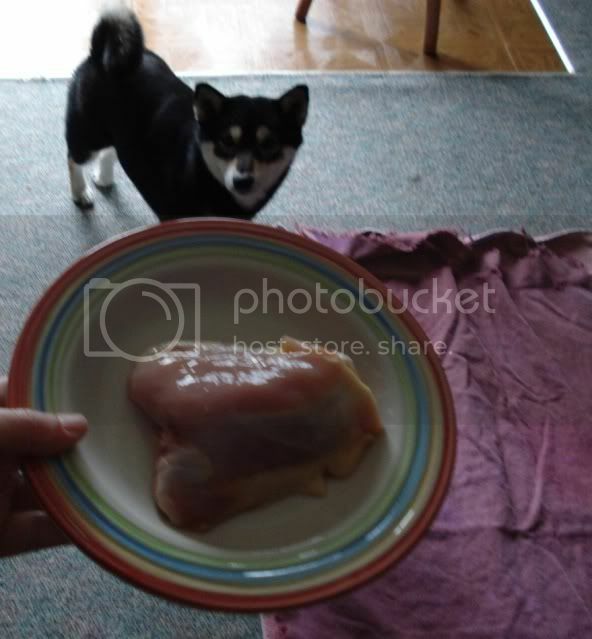 Our family does a lot of whole roasted chicken and we used to either throw the chicken back and neck away (or something use them for stock) but now I think I'm just going to collect them and give them to my Shiba. Yummy Chicken liver, chicken foot and caned tripe. Anyways here's funny raw story it happened in 2010. I had put a ad up on craigslist for free freezer burned meat and someone mom knows at work says there is a ad for someone wanting freezer burned meat and there is picture of a dog that looks just like Saya! She shows mom and she says yeah it looks like her! She comes home and tells me this and I tell her I had put the ad up on it. Yeah right like a french bulldog and a collie mix is really a fighting dog. Crazy. Piece of white fish yummy. Quick question. I feed Penny kibble (she gets Blue Buffalo currently, but I may switch her to the grain free Blue when she starts on adult food), and I am not.planning on feeding her raw, but it seems like you are saying that raw as a treat is good too? What size or what type of thing would you do for a treat of raw? Also I was just curious about the egg. Can you tell me the benefits of mixing a raw egg.into the kibble? I'm curious. Okami's rather funny sometimes. When she was still on kibble and canned food, she'd practically inhale it like she was starving. But now that she's on a complete prey model raw diet, she's suddenly gotten picky! Bella is fed kibble mainly she is my parent's dog's and she gets raw as a meal instead of kibble in pm once or four times a week depends on what I got. 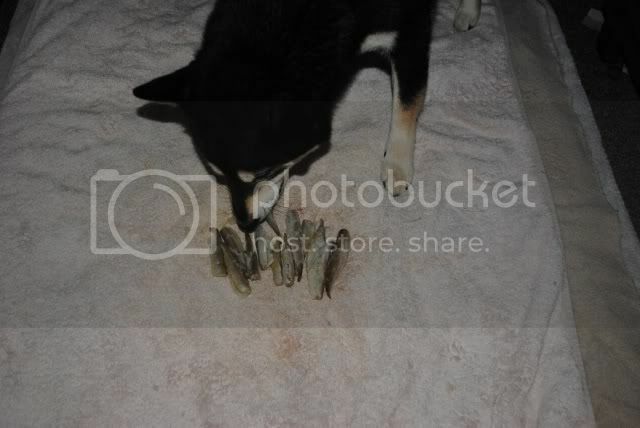 Bella gets things like chicken quarters with bit of boneless meat, tongue or liver. Bella is 55 or 58lbs so she eats bit more.. Bella also gets whole chicken roaster cut up into meal size portions, pork ribs, lamb neck, chicken necks, turkey necks, and pork shoulder roasts. When Saya was still on kibble she got a rack of lamb ribs along with a egg, and caned sardines or salmon once a week as a meal she did fine no poop issues or bile vomits due to no food in stomach. Each rack of ribs I got were like 8 in it sometimes bit less sometimes they were individual or a whole rack kind thing. 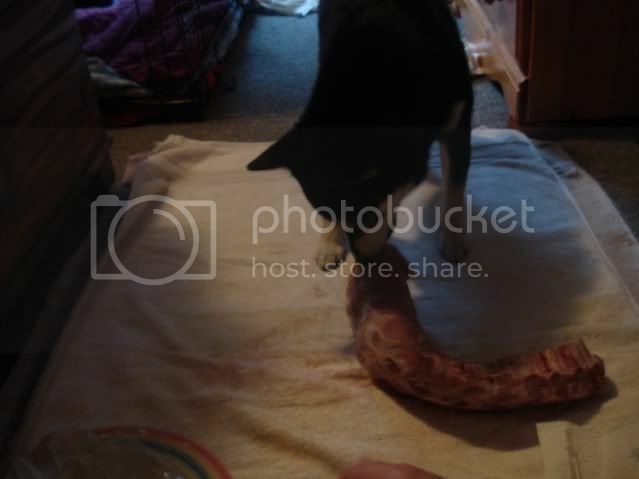 Saya being new to it she would mostly gnaw bit of bone off and eat mainly the meat. "What size or what type of thing would you do for a treat of raw?" 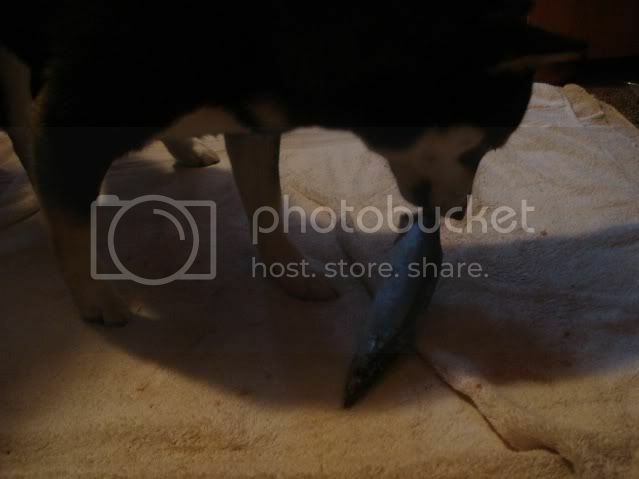 Depends on the dog, but Saya does good with any type bone in item.. I don't give beef marrow bones I'm bit afraid she would chip her teeth never given those types of bone before so I dunno.. I know some here give them with no issue. I guess something like chicken drumstick, thigh, breast, necks would be fine as long as it's not enhanced by broth. Take skin off at first to be sure of no tummy issues and slowly keep the skin on it. If your dog is allergic to chicken pork ribs, lamb ribs make good chews. Lamb is more edible then pork being as it's a young animal. Saya has had pork feet split kind when she was new to raw getting used to pork protein she did good on it, but it's very boney item I'd give it for a bit then take away for next day or next week as a treat it's OK, but if I gave it to Saya as a meal I'd give her a bit of boneless meat with it. Chicken feet make yummy treats and is natural source of glucosamine Saya at first took her while to get into chicken feet, but she loves them now. Reason I say start with chicken first is because it's bone is easily edible, and cheaper priced. I started giving lamb ribs once week at 7months while she was on kibble with no issue first time she ate kibble as dinner and I gave one rib before bed then next day she got another then I did whole thing of ribs as a meal instead of kibble. I sometimes give Bella a chicken neck, pork ribs, chicken foot, or turkey neck as a snack like at lunch time then dinner she gets normal kibble meal so far no issues..
Saya can handle chicken necks, wings, lamb necks, lamb ribs, pork shoulder roast bone(She can gnaw off the joint and soft part of the bone), turkey breast, neck, drumstick, and back. Some dogs can't handle turkey bone in items some do Saya does just fine she weighs 20lbs or so..
She once ate whole turkey drumstick very big meal it was her whole days worth meal she did get a egg in am. Now she is on raw she gets a egg once or twice a week I think eggs are good source of vitamins, protein and make yummy snack. When she was on kibble I gave a raw egg once a week when she was 6months she had no issues with it most times I'd give it alone as a snack between her meals like a lunch or something.. Egg supposed to be good for their coats or something. Cooked eggs is yummy too if your worried about raw mixing with kibble. There's a lot of things saying eggs aren't good raw due to avidin or whatever and some say it's fine. I feel the yolk in the egg contains enough biotin. Yolk has a lot of vitamins and nutrients. As long your not feeding tons of eggs then there shouldn't be an issue cooking fix the avidin issue, but I still think a raw egg won't hurt the dog especially if it's just given once or twice a week. For a dog new to eggs I'd only give a bit one day and the rest the next so the dog can get used to it since eggs are rich. Then one egg once week. Saya mostly gets one egg a week sometimes twice a week with no issues. I give eggs by cracking it in her dog bowl and mixing it up sometimes I don't mix it. I sometimes mix her solid gold seameal with the egg or put bit of coconut oil, or bit caned sardines or salmon or just plain egg. I don't give her egg shell since she doesn't eat it. I wish I had a camera so I can show you all, but yesterday I thought of going further into Niko's diet as I brought him a veal kidney and some lamb shoulder chops. This is the first time Niko will be fed kidneys and I'd appreciate some advice as to how to incorporate it, break it down, or just up front and hand over the kidney. Next week I'm going to the meat market again for more gizzards and meats, I want to start adding more liver and hearts after he turned 2yrs on the 17th. On his diet now he's just been eating breast, quarters, wings and necks. With organs like kidneys, liver, pancreas and so on introduce it slowly give a small piece and then another small piece and increase it as he gets used to it. Don't rush into it since organs are rich can cause loose or watery poop if dog isn't used to organs or that type of organ. Saya gets her full amount of liver one meal each week same for other secreting organ, but some dogs need the amount to be split up. Best to give it with bone in item too. Heart, gizzards, tongue are counted as muscle meat organs something like that still good to give, but doesn't count as other secreting organ. Those items are rich too so don't give too much till the dog is used to it. Saya can eat a whole meal of heart no issue, but some can't or need to work up to it. Don't rush into too much variety at once work on getting used to new protein then organ and then next thing. Saya used to get beef thymus and beef pancreas along with her liver, kidneys and now testee.. I rotate between her liver varieties each week and same for other organs.